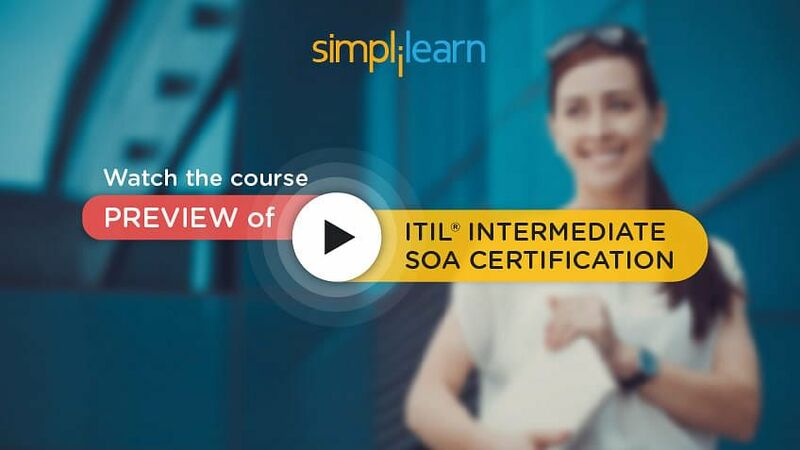 Welcome to lesson 2 of the ITIL Intermediate SOA tutorial, which is a part of the ITIL Intermediate SOA Foundation Certification course. In this lesson we will learn about Service Portfolio Management and its features. Understand the complete overview of the objectives, scope, and importance of service portfolio management and of how it relates business services to IT services. Explain the Service portfolio management policies, principles, concepts, activities, methods, and techniques about SOA practices. Describe the relationship of service portfolio management to the service catalog and service pipeline. Review the efficient use of service portfolio management metrics. Let us now begin with Service Portfolio Management. Service portfolio contains information on three domains, and they are service pipeline, service catalog, and retired services. The Service Pipeline contains information on services that are under development. These are the future services for an organization, and they will (in due course, following design, development, and testing) be transitioned into the live environment. The organization’s future growth plans and strategic approach are reflected by the contents of the pipeline. The level of an organization’s Continual Improvement activity, as well as the degree of proactive work by Service Strategy and Service Design, will be reflected in the Service pipeline volumes. The Service catalog section of the Service Portfolio sits between the Service Pipeline and Retired Services. It contains information on all services that are being delivered by Service Operation as well as all those services that are ready and approved to be transitioned into production. Importantly, the Service catalog is visible to customers. It is like a menu of services available to customers. The Service catalog represents the Service Provider’s current capability whereas the Service Pipeline centers on future capability. Ideally, the Service catalog should be integrated with the Configuration Management Database (CMDB). Retired Services are services that have been taken out of production and that are not in operational use. It may be that services have come to the end of their natural life, have been superseded, are no longer demanded or are no longer cost-effective. Information on those services that have been retired is stored in the organization’s Service Knowledge Management System (SKMS) because it may be useful in the future. Service Transition is responsible for the phasing out of services. We will learn the objectives or purpose of service portfolio management in the next section. Willing to take up a course in ITIL Intermediate SOA? Check out the Course Preview here! The purpose of service portfolio management is to ensure that the service provider has the right mix of services to balance the investment in IT with the ability to meet business outcomes. It tracks the investment in services throughout their lifecycle and works with other service management processes to ensure that the appropriate returns are being achieved. Also, it ensures that services are clearly defined and linked to the achievement of business outcomes, thus ensuring that all design, transition, and operation activities are aligned to the value of the services. Provide a process and mechanisms to enable an organization to investigate and decide on which services to provide, based on an analysis of the potential return and acceptable level of risk. Maintain the definitive portfolio of services provided, articulating the business needs each service meets and the business outcomes it supports. Provide a mechanism for the organization to evaluate how services enable it to achieve its strategy and to respond to changes in its internal or external environments. Control which services are offered, under what conditions and at what level of investment. Track the investment in services throughout their lifecycle, thus enabling the organization to evaluate its strategy, as well as its ability to execute against that strategy. Analyze which services are no longer viable and when they should be retired. Let us discuss the scope of service portfolio management in the next section. The scope of service portfolio management is all the services a service provider plans to deliver, those currently delivered and those that have been withdrawn from service. The primary concern of service portfolio management is whether the service provider is able to generate value from the services. The service portfolio management process will, therefore, track investments in services and compare them to the desired business outcomes. Internal service providers will need to work with the business units in the organization to link each service to the business outcomes before they can compare the investment with returns. External service providers tend to evaluate value more directly, as each service needs to be able to generate revenue directly or support revenue-generating services. The generation of revenue in an efficient manner will, in turn, facilitate profitability. Service portfolio management evaluates the value of services throughout their lifecycles and must be able to compare what newer services have offered over the retired services they have replaced. Now, we will discuss the value of Service portfolio management to the business. Service portfolio management enables the business to make sound decisions about investments. Services cannot be implemented because they are a good idea or because they are an industry standard. They are implemented only if there is a good business case demonstrating a clear return on investment. Service portfolio management does this by comparing the outcomes that are expected by the customer with the investment required to build and deliver the service. Customers are able to understand exactly what the service provider will deliver to them and under what conditions, enabling them to make decisions about whether the service is a good or bad investment and to evaluate additional opportunities that the service will open. In this way, service portfolio management can also be a tool for innovation for the organization. The service provider is viewed as a steward of service assets that are essential to the customer’s success and, provided the service provider delivers what they promised, the service provider can equip their customers to build their strategies. Let us look into the diagram, which describes The Service Portfolio. 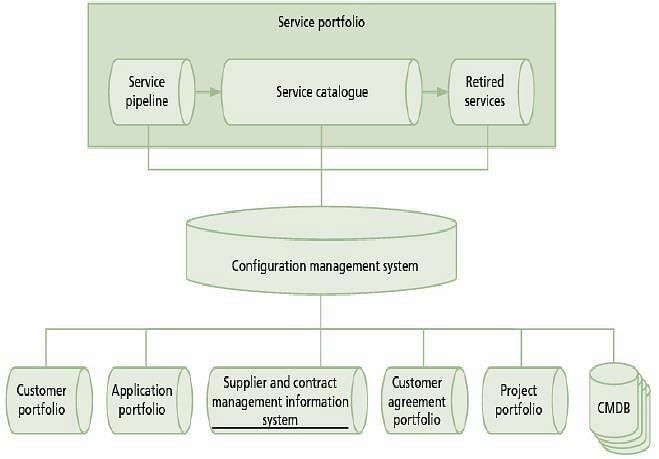 The Figure shown below illustrates the components of the service portfolio, which are discussed in detail in the following sections. Let us now understand what the service pipeline is. The service pipeline is a database or structured document listing all services that are under consideration or development but are not yet available to customers. It also includes any major investment opportunities, such as a data center relocation or virtualization project. This is because these investments have to be traced to the delivery of services and the value that is realized. The service pipeline provides a business view of possible future services and is part of the service portfolio that is not normally published to customers. The service pipeline represents the service provider’s growth and strategic outlook for the future and reflects the general health of the provider. It also reflects the extent to which new service concepts and ideas for improvement are being fed by service strategy, service design, and continual improvement. Good financial management for IT services is necessary to ensure adequate funding for the pipeline. There are many ways in which a service can enter the service pipeline, for example, A customer requests a new service. The service provider’s strategy has identified a new opportunity. A customer has identified a new business opportunity that will require support from IT. A business outcome is under-served by current services. New technology is available and has the potential to create new business opportunities. Service management processes (like capacity management, service level management or problem management) identify a better solution to the services that are currently offered. Continual service improvement processes identify a gap in the current service portfolio. The service pipeline ensures that all of these opportunities are properly quantified regarding investment and return, and then moved through the service design and service transition lifecycle stages until they are available for live use. This ensures that potential opportunities are formally registered and processed and not overlooked in an ever-changing set of customer demands. Now, we will look into the Service catalog Features. 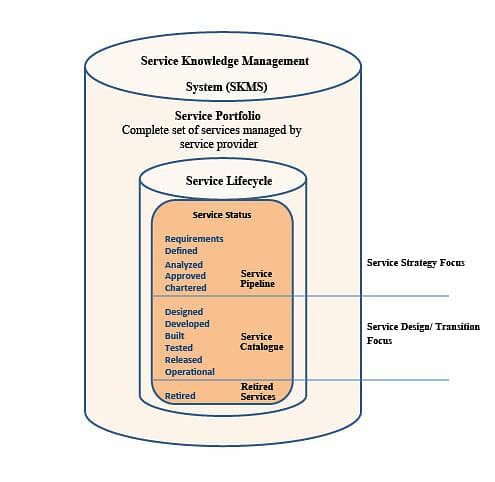 The service catalog and service catalog management are described in detail in ITIL Service Design. This section describes the role of the service catalog in-service portfolio management and the relationship between the service portfolio, service pipeline, and service catalog. The service catalog is a database or structured document with information about all live IT services, including those available for deployment. The service catalog is the only part of the service portfolio published to customers and is used to support the sale and delivery of IT services. The service catalog includes information about deliverables, prices, contact points, ordering and request processes. Items can enter the service catalog only after due diligence has been performed on related costs and risks. Only operational services can be found in the service catalog and resources are engaged to fully support active services. The catalog is useful in developing solutions for customers from one or more services. Items in the catalog can be configured and suitably priced to fulfill a particular need. A service catalog is an important tool for service strategy because it represents the service provider’s actual and present capabilities. Many customers are only interested in what the provider can commit now, rather than in future. Also, the service catalog serves as a service order and demand channeling mechanism. It defines and communicates the policies, guidelines, and accountability required for the service provider to deliver and support services to its customers. Now, we will look into the Service catalog functions. The service catalog details each service and shows the service components that make up each one. It also provides an overview of the assets, processes, and systems involved in each service. It acts as the acquisition portal for customers, including pricing and service-level commitments, and the terms and conditions for service provision. Also, the service catalog contains details about standard service requests, enabling users to request those services using the appropriate channels. In automated service catalogs these requests can be initiated in the tool, and then routed to the appropriate request fulfillment procedure. When service providers have many customers or serve many businesses, there may be multiple service catalogs projected from the service portfolio. In other words, a service catalog articulates the provider’s operational capability within the context of a customer or market space. A service catalog is also a tool for service portfolio management decisions. At one level it identifies the linkage between service assets, services, and business outcomes. This information is used to identify where existing services are used to meet current business outcomes and to identify potential gaps in the service portfolio. At another level, the service catalog identifies the demand for a service and shows how the service provider will fulfill the demand. Figure in the section shows the same relationships but regarding demand. Every time the business works to achieve a business outcome, it places a demand on the services. Demand management identifies these patterns of business activity and how they are fulfilled by services. In the Figure, demand management has been able to show that some services are able to meet the level of demand better than others. It is also clear that there is some demand that is not being met at all. The figure also shows that there are some services that are not properly supported, and capacity management has identified some service assets that are either under-utilized or not utilized at all. Now, we will look into the comparison of Service Portfolio and Catalog. The following table shows Comparison of typical content and purpose of service portfolio and catalog. Let us now understand what Retired services are and why they are maintained in the service portfolio. Some services in the service portfolio are phased out or retired. There is a decision to be made by each organization, following a service review, on when to move a service from the catalog to retired. Some organizations will do this when the service is no longer available to new customers, even though the service is still being delivered to existing customers. Other organizations will only move the service out of the catalog when it is no longer delivered to any customers. Retired services are maintained in the service portfolio for some reasons, including The replacement service might not meet all requirements, and it is important to be able to fall back to the previous service. When defining a new service, service portfolio management might discover that some functionality is available from a retired service. This might result in the service being reinstated as part of a new service. There might be regulatory requirements to maintain archived data that can only be accessed using the previous service, in which case information is exported to a read-only database for future use. The service portfolio management process will define a policy for the length of time that service will remain in the service portfolio. This could be expressed in time, or how many alternatives are available in the service catalog. Retiring services is managed through service transition. This is to ensure that all commitments made to customers are duly fulfilled, and service assets are released from contracts. When services are retired the related knowledge and information are stored in a knowledge base for future use. Retired services are not available to new or existing customers or contracts unless a special business case is made. Such services may be reactivated in operation under special conditions and SLAs that are to be approved by senior management. This is necessary because such services may cost a lot more to support and may disrupt economies of scale and scope. Let us discuss the other important aspects of Service Portfolio Management or SPM. There are a set of tools and databases that are used to manage an IT Service provider’s Configuration data. The CMS also includes information about Incidents, Problems, Known Errors, Changes, and Releases; and may contain data about employees, Suppliers, locations, Business Units, Customers, and Users. The CMS includes tools for collecting, storing, managing, updating, and presenting data about all Configuration Items and their Relationships. The CMS is maintained by Configuration Management and is used by all IT Service Management Processes. Application, customer and customer agreement portfolio will be discussed in more detail in the BRM process. Service models codify the service strategy for market space. They are blueprints for service management processes and functions to communicate and collaborate on value creation. Service Models describe how service assets interact with customer assets and create value for a given portfolio of contracts. SPM uses service models to analyze the impact of a new service or changes to existing services. Now, we will learn the phases of SPM in the next section. How about investing your time in ITIL Intermediate SOA Certification? Enroll in our Course now! Charter: communicate decisions, allocate resources and charter services. In the next section, we will look into a diagram which describes an example of how the four phases SPM can be executed as a process. An example of how these four phases can be executed in a process is given in the picture and described in detail below. Before defining and executing the process, however, it is important that the service portfolio itself is defined. Defining the service portfolio begins with collecting information from all existing services as well as every proposed service. The cyclic nature of the SPM process set means that the ‘define’ phase not only creates an initial inventory of services but also validates the data on a recurring basis. Different portfolios will have different refresh cycles. Some cycles will be triggered by a particular event or business trend. For example, a merger and acquisition event triggers a portfolio re-examination. Let us understand the process activities. This part of the process is about defining desired business outcomes, opportunities, utility, and warranty requirements and the services themselves as well as the anticipated investment to achieve these. Once approved, these will be moved into the service design stage for design and development. This section talks about the process for managing the definition of services. Strategy – Any new strategy or change to an existing strategy should be submitted to service portfolio management. This will be in the form of strategic plans, identified market spaces, and outcomes, priorities, and policies. These will be used to identify specific service opportunities and the stakeholders that will be consulted in defining the services. Request from business – Come in different formats, from informal to detailed proposals. Defining a standard method to record these requests and documenting them is required to progress through service portfolio management process. Service improvement opportunity and plan – Not all improvement opportunities and SIPs are about changing services. Many relate to the processes, people, and tools that support or deliver the service. These opportunities still will be reported to the service portfolio management process. Service suggestion – Many service suggestions would fall under the control of change management. These suggestions are also submitted to service portfolio management process which requires defining of standards. Service, customers, and business outcome – In this step, the service portfolio management process will define the service based on the information provided. The defining of these services must be based on the actual customer and business needs. Impact on service portfolio – The service portfolio management process will already know the details of the customers, utility, and warranty of existing services. To evaluate the impact of service portfolio on key areas requires double checking of the information recorded in the service portfolio. Impact on service model – The service portfolio management process will need to determine whether there is any impact on the existing service model. Therefore defining the standards is essential to check the impact. This will also help to identify all the technical stakeholders that will need to be involved in analyzing the service. Let us discuss and analyze the service portfolio review as well as analyze investments, value, and priorities in the next two sections. The analysis of each service moving through the service portfolio management process is performed by linking each one to the service strategy. For external service providers, this will be a linkage to the organization’s overall strategy. For internal service providers, it will mean linking to the IT strategy and the strategies of the other business units. What capabilities and resources are required for the organization to achieve those services? In other words, service portfolio management articulates how the perspective, position, plan, and patterns will be translated into actual services. The answers to these questions guide not only the analysis but also the desired outcomes of service portfolio management. The ability to satisfactorily answer these questions requires the involvement of senior leaders and subject matter experts. The way in which services will be analyzed needs to be clearly defined before the analysis actually begins. If the organization does not understand what analysis it will perform, it is unlikely to know the right data to collect. Data collection exercises are usually disruptive and should be as streamlined as possible. The analysis phase requires input from multiple specialized areas. Identifying the correct people to perform analysis for each service can be quite challenging. For this reason, some organizations use a standard pool of senior architects and managers (the service architecture board – SAB) to evaluate each service and assign analysis tasks to specific groups based on the type of knowledge and skills required for that service. This group will also validate the analysis work and ensure that the change proposal is properly prepared. This is an ongoing activity within service portfolio management, which is aimed at regularly reviewing existing services in the service portfolio to determine whether they still meet their objectives and whether they are still appropriate for the strategy of the organization. The review will also ensure that services in the service pipeline are properly defined, analyzed, approved and chartered. Service portfolio management works with financial management for IT services to use some techniques to quantify the investment and value of each service. This requires an understanding of the business outcomes to be achieved, how the service will be used to achieve those outcomes, any supporting services that will be used, and how these are linked to the achievement of the business outcomes. To achieve this mapping of service assets to services to business outcomes, service portfolio management starts to document them in the service portfolio. 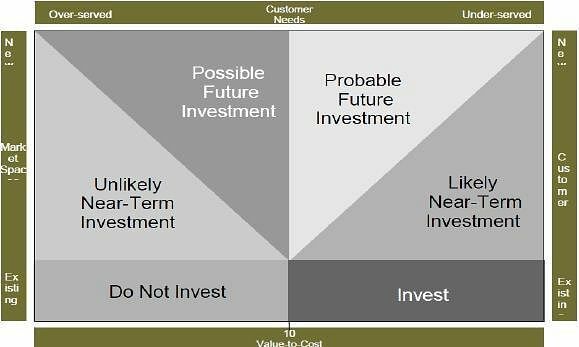 Using these techniques to map money spent to value added to value realized, service portfolio management is able to work with the customer to calculate the value of the service. This can then be compared to the value of all services in the current strategy, and the effort to build and deliver them can be prioritized. Let us learn the different types of strategic categories by which Services would be classified and the further classified categories. Once the services have been analyzed using techniques similar to the option space tool, executives will need to decide which services will take priority. Run the business (RTB) - RTB investments are centered on maintaining service operations. Grow the business (GTB) - GTB investments are intended to grow the organization’s scope of services. Transform the business (TTB) - TTB investments are moves into new market spaces. Each of these categories is further classified regarding the type of budget that will be available for this category of service. Since some types of investment are riskier than others, executives allocate funding so that there is a balance between higher-risk categories of spending and lower-risk categories. Venture - This is the portion of the budget that is available to create services in a new market space. Growth - This is the portion of the budget that has been allocated to create new services in existing market space. Discretionary - This is money in the budget that is available if needed, but which does not have to be spent. This portion of the budget is often used to provide enhancements to existing services. Non-discretionary - This represents money that has to be spent to operate and maintain existing services. Core - This is the portion of the budget that takes the highest priority since it is used to operate and maintain business-critical services. Let us discuss the outcomes for existing services, which fall into six categories. Once the value proposition has been articulated and a business case documented, service portfolio management can work with the customers and business executives to decide whether the service is feasible. This is the first ‘go/no-go’ decision in the process. Up to this point,t service portfolio management has facilitated a good understanding of the desired future state of services in the organization. At this point, decision makers in the organization decide on which aspects of that anticipated future state are feasible. With approvals comes the corresponding authorization for new services and resources. There will be a second ‘go/no-go’ decision once the detail of the new service has been defined and a more accurate estimate of the investment is understood. One risk associated with these decisions is the fact that a detailed design has not been completed and the anticipated level of investment may be inaccurate. Each decision maker will need to understand this risk and must be notified of significant changes to expenditure on the service or change at each major stage of the project. Largely self-contained, with the well-defined asset, process and system boundaries, these services are aligned with, and are relevant to, the organization’s strategy. These services do not meet minimum levels of technical and functional fitness. Often organizations discover they are offering services that are composed of multiple releases of the same operating system, multiple versions of the same software and/or multiple versions of system platforms providing similar functions. The duplication will have to be removed and a single solution is chosen that best fits the strategy and customer or business requirements. Rationalization also applies to service with unclear or overlapping business functionality. Often services that meet the technical and functional criteria of the organization display fuzzy process or system boundaries. An example would be a service handling its own authentication or continuity functions. In these cases, the service can often be refactored to include only the core functionality, with common services used to provide the remainder. Refactoring is also useful when a service embeds potentially reusable services within itself. These services meet functional fitness criteria but fail technical fitness. An example may be a service whose fulfillment elements include a mainframe system and frame relay network that still supports business-critical processes where the strategic direction of the organization is to retire the mainframe platform and source an MPLS (Multi-Protocol Label Switching) WAN. Services that no longer meet a business objective or strategy. These services may be identified by customers or technical groups, but many will only be discovered during the service portfolio review. A service will not be feasible if it is not able to achieve the required business outcomes, or if the level of investment is too high for the estimated return. The service portfolio management process will facilitate the decision to retire the existing service or to stop any further design activity. In most cases, the business and/or customer will have been involved in this decision. However, they may still want to pressure the service provider to move ahead with the service anyway. This will cause the service provider to deviate from the agreed strategy of the organization, and it is also likely to result in the service provider having to deliver services that either they are not capable of delivering, or they have no funding for. It is vital that the service provider is not put into this position, and they will require the full support of the organization’s executives once a decision has been made that a service is not feasible. In the next section, let us understand what the Charter is. A noun referring to a document which is used to authorize work to meet defined objectives, outputs, schedules, and expenditure. Charters are normally used to initiate the design stage of projects. In service portfolio management, services are chartered using a service charter. The service charter ensures that all stakeholders, development, testing, and deployment staff members have a common understanding of what will be built, by when and how much it will cost. The implication of using the term ‘charter’ is that the changes will be managed using a project management approach, which in larger organizations will be managed using a PMO. Since this activity will be performed as part of a project, the service charter will also be an input into the project management process (to initiate the design stage of the project) and will be entered into the project portfolio. Let us discuss the process inputs and outputs in the next few sections. Project updates for services in the charter stage of the process. As we discussed in this section about inputs to service portfolio management, now in the next section, we will discuss the process outputs. Change proposals that are used to allow change management to assess and schedule the work and resources required to charter services Identified strategic risks. Let us learn the major service portfolio management interfaces. Service catalog management is closely linked with service portfolio management in that the service catalog is part of the service portfolio. However, service portfolio management determines which services will be placed in the service catalog, while service catalog management performs all the activities required for this to be done. Strategy management for IT services defines the overall strategy of services and therefore determines what type of services should be included in the portfolio, and which should not. It also determines the objectives for investments (what levels of investment can be made and what the anticipated returns should be), and the ideal market spaces which will be targeted. Financial management for IT services provides information and tools to enable the service portfolio management process to perform return on investment calculations. Also, financial management for IT services also helps to track the actual costs of services to enable service portfolio management to track the accuracy of forecasts. This will be used to improve the analysis of services in the future. Demand management provides information about the patterns of business activity that is used to determine the utilization and expected a return on investment for the service. Business relationship management initiates requests and obtains business information and requirements that are used in defining services and evaluating whether they would provide a sufficient return on investment. Business relationship management also keeps customers informed about the status of services in service portfolio management. Service level management ensures that services are able to achieve the levels of performance defined in service portfolio management and provides feedback when this is not the case. Capacity management and availability management ensure that the capacity and availability requirements of chartered services are designed and built. IT service continuity management identifies the business impact of risks associated with delivering the service and designs countermeasures and recovery plan to ensure that the service is able to achieve the objectives defined during service portfolio management process. Information security management ensures that the confidentiality, integrity and availability objectives defined during service portfolio management process are met. The supplier management process indicates that a supplier will no longer be able to supply services or that a supplier relationship is at risk. Change management evaluates the resources required to introduce new services or changes to existing services, thus enabling the service to be chartered. Change management also ensures that all changes involved in designing, building and releasing the service are controlled and coordinated. Service asset and configuration management provide the tools, information, and data upon which the service portfolio is based. It also provides data and information for service models. Service validation and testing ensure that the anticipated functionality and returns of each service can be achieved. Knowledge management enables IT managers and architects to make informed decisions about the best service options to meet the organization’s objectives. Continual service improvement provides feedback about the actual use and return of services against their anticipated use and return. This information is used to improve services and make changes to the mix and availability of services in the service portfolio. As of now, we have already learned about major service portfolio management interfaces. In the next section, we will take an overview of the main sources of the documentation and information required for effective service portfolio management. The service portfolio, consisting of a service pipeline, service catalog, and retired services. The project portfolio to manage services that have been chartered and are being designed and built. The application portfolio that allows service portfolio management to understand the relationship between applications and services. The customer portfolio and customer agreement portfolio that allows service portfolio management to understand customer requirements, the services that have been designed to meet those services, and the agreements which have been made to deliver the services. Service models which allow service portfolio management to understand the composition and dynamics of a service before it moves into the rich design and builds activity. Service models also indicate where a service may leverage existing investments. The service strategy, which provides a framework of anticipated opportunities, constraints, objectives, and desired business outcomes. Service portfolio management is expected to define what mix of services can best meet the strategic objectives of the organization. 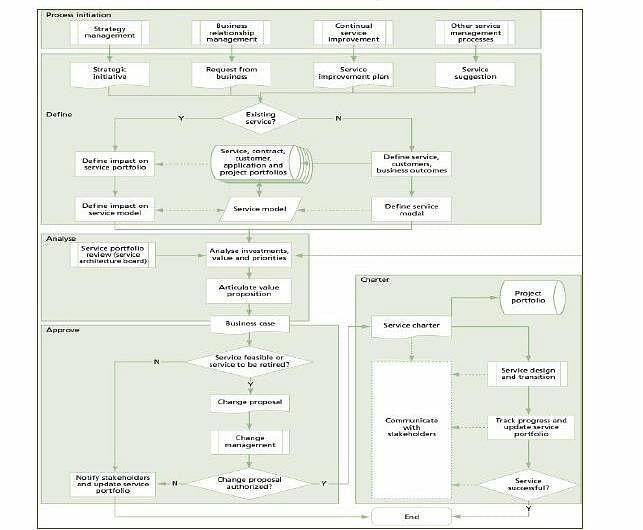 The configuration management system provides data and information that supports the development and assessment of service models and the assessment of new services and changes to existing services. Let us look at a couple of examples of critical success factors (CSFs) and key performance indicators (KPIs) in the next section. This section provides examples of critical success factors (CSFs). These are the conditions that need to be in place or things that need to happen if the service portfolio management process is to be considered successful. Each CSF will include examples of key performance indicators (KPIs). These are metrics that are used to evaluate factors that are crucial to the success of the process. KPIs, as differentiated from general metrics, should be related to CSFs. The following list includes some sample CSFs for service portfolio management. Each organization should identify appropriate CSFs based on its objectives for the process. Each sample CSF is followed by a small number of typical KPIs that support the CSF. These KPIs should not be adopted without careful consideration. Each organization should develop KPIs that are appropriate for its level of maturity, its CSFs and its particular circumstances. Achievement against KPIs should be monitored and used to identify opportunities for improvement, which should be logged in the CSI register for evaluation and possible implementation. A formal service portfolio management process exists under the ownership of the service portfolio management process owner. The service portfolio management process is audited and reviewed annually and meets its objectives. Every service has a documented statement of the initial investment made in the service. Accounting records are produced on a monthly or quarterly basis to show the ongoing investment in each service. These are compared with the business outcomes that have been achieved and the return on investment is calculated. Customer surveys indicate a high level of satisfaction with the value they are receiving. Each service has documented risks associated with it. The service portfolio will identify what mitigation or countermeasures have been taken, and where the customer has decided to live with the risk. Now, we will discuss the Challenges and the risks of the service portfolio management process. Wish to have in-depth knowledge of ITIL Intermediate SOA? Check out the Course Preview! Lack of access to customer business information, which will prevent service portfolio management from understanding the desired business outcomes and strategies. The absence of a formal project management approach. This will mean that it is more difficult to charter services and track them through the design and transition stages. The absence of a project portfolio – which will make it difficult to assess the impact of new initiatives on new services or proposed changes to services. Absence of a customer portfolio and customer agreement portfolio, which will make it difficult to identify the objectives, use and return on investment of services. A service portfolio that only focuses on the service provider aspects of services. This will make it difficult to calculate the value of services, model future utilization or validate the customer requirements for the service. The lack of a formal change management process, which can be used to control the introduction of new services, or manage changes to existing services. Making a decision to offer services without validated or complete information. Often customer pressure to offer a service means that the decision is rushed, and service portfolio management has not completed a full investigation of the risks associated with the service. Offering services without defining how they will be measured. It is very difficult to calculate the return on investment of a service that has not been designed around a clear value proposition. In situations where cost-cutting is being considered, service providers may find themselves being forced to eliminate services which appear to be valuable, but for which no tangible returns can be demonstrated. Now, we have come to an end of module 2. Let us move on to the next section. Service Portfolio should form part of a comprehensive Service Knowledge Management System (SKMS) and registered as a document in the Configuration Management (CMS). Should contain information relating to every service and its current status. This brings us to the end of Service Portfolio Management tutorial. The next lesson talks about Service Catalog Management.